I must be a bit weird, or maybe just different because I like Panama City. Most people that I speak to, hate it. They say it’s too noisy, it’s polluted, and to round it off the climate is hot and humid. The Honolulu of Central America Ok, raw sewage is still being dumped into the bay and sometimes on a hot day the smell can knock over a bus shelter. But those busses are wonderfully decorated. True, they have had every vestige of a muffler or noise reduction removed from them- at least that’s what it sounds like. Yes, alright, sometimes the heat and humidity make Alaska look inviting, but when the sun sets and the moon and stars come out – Panama City becomes . . . the Honolulu of Central America. A definite place to stop is at the Wine Bar. This is one spot that’s perfect day or night but in the evening it comes into its own. A warm and cosy little place that just whispers romance and intimacy. At one end there is a set of book shelves and a faux brick wall. Up above a trellis is festooned with intertwining grape vines ( Ok, they are artificial . . . come on, come on, where’s your sense of fantasy.) The place has a lot of wood and is very Parisian bistro in style although I believe the intention was to make it Romano-Italian. 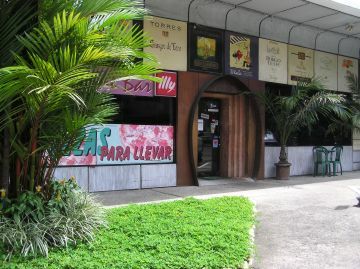 Here you can sit with the love of your life and sip on a vast variety of imported wines. Friends of ours regularly come here and buy a whole case of wine to take back home. The price is amazing –less than $4 a bottle. The wine bar menu features 18 different kinds of cheeses, from Gruyere and Emental to Havarti and Camembert. Three ounces cost $4,95. A large mixed plata is $27.95. I tried and enjoyed the Chicken Lasagna at $6.95 and was severely tempted by the thirteen desert items at $2.95 each. Fortunately I didn’t spot the Tiramisu, otherwise my resolve would have shrunk and my waistline would have done the opposite. The wine bar feels like some wonderful European writers hang out. I have written two books (as yet unpublished) and I feel some time spent soaking up the atmosphere here might just fire me up enough to face the cruel world of literary rejection. I can think of no better place to do background research on my novels than sitting in the Wine Bar with a large glass of Australian Shiraz in my hand and a plate of cheese at my finger tips. 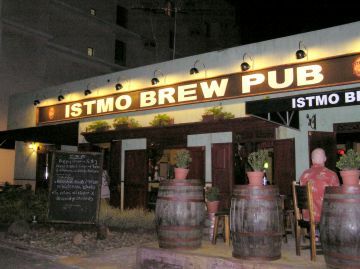 Right across the road from the wine bar is the Istmo Brew PubI marveled that Panama City would have its own micro brewery in an authentic setting, this could have been Dublin or West Wales. Michelle Melfi, the assistant manager, welcomed my wife and me. The first thing that caught my I was the enormous stainless steel brewing vats. Here, every month Colombian born brew master, Dixlon Hernandez makes 1,000 liters of beer. Dixlon prides himself that at the Istmo they use no preservatives in their product, just old fashioned barley, hops and malt. Dixlon was quick to point out that the hops were imported from the home of “real beer” Munich, Germany. For first time customers The Istmo Brew Pub presents you with six taster glasses, of the various beers. The beers were named after different provinces of Panama and the dark “Cocle” caught my fancy so I ordered a liter. The only drawback I found was that the filtering needed a little bit of work. The lighter, lager style beers were quite cloudy and were no match for the imported Lowenbrau that the pub also sells. The outstanding thing was the foam on the dark beer – and in this I think they might have a winner – the foam has that beautiful sweet frothy taste that makes The Irish porters so agreeable. Arguably, Guinness, Murphy’s or other Irish beers would not be so popular without that exquisite foamy, creamy nectar at the top. The Istmo Dark Cocle beer has that exact sweet taste. It’s beautiful. Spice of India anyone? On the following night I decided to road test my taste buds and try Indian food. I know most people are absolute “wimps” when it comes to Indian food, they believe it is too hot and they don’t trust the ingredients. Trust me half of the United Kingdom grew up on Indian food and the billion or so people who live in India have most probably tried it the odd time. The Masala, Panama City’s best Indian food Koreena Bajwa the owner, hails from Calcutta and speaks perfect English (to be honest most Indians speak better English than most English people)She introduced me to a dish called “Thali.” This is a mutton curry that comes in several bowls along with a serving of “Raita,” which is a mixture of Cucumber, onions, potatoes and that all important ingredient –yogurt. 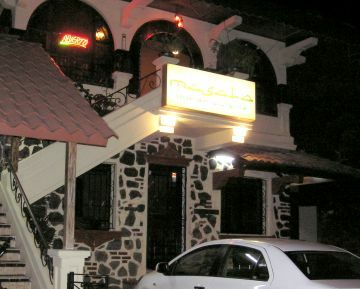 The Masala restaurant is located on Calle 42 east, in the Bella Vista district of Panama City and is on the second floor of one of Panama City’s wonderful old houses. If you order a beer they will serve it in chilled mug (nice touch) or you could order wine at $20 a bottle. Another meal I really liked was called “Murgh Tika.” This is a red coloured, boneless chicken that I found quite delicious. 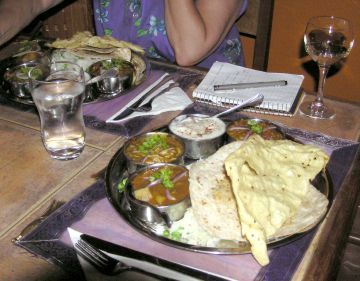 You may see an item on the menu called “Vindaloo.” This is a meal only for those blessed with an asbestos larynx. 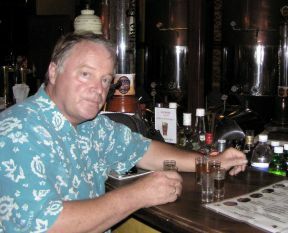 I tried it once in Belize City and next morning had to check the bill to see if the waiter had confused the Vindaloo order with one for molten lead. Koreena initiated me into one of the arcane secrets of Indian cuisine-that being how to eat hot spicy food without incinerating some part of your lower intestine- the secret: Yogurt. That dish I mentioned earlier with the onions, potatoes, – eat that with your meal and in the morning you will have no ill effects. I field tested this and bless her heart, Koreena was perfectly correct. 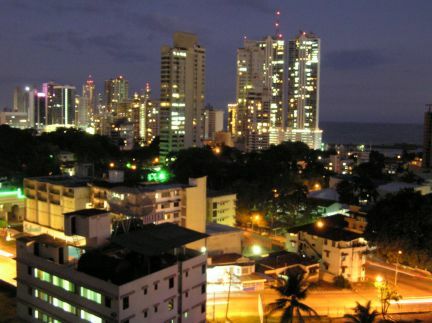 So while in Panama City, do as increasing numbers of Panamanians are doing and that is eating and enjoying hot,spicy, Indian food.